Last week the FCC made public Samsung's filings for the Galaxy S7 and S7 Edge handsets, revealing their model numbers for Verizon, AT&T, T-Mobile and US Cellular, as well as a few other interesting tidbits. What was missing, though, was battery capacity, and that's something we are usually able to obtain from FCC filings sooner or later, as the documentation about the device there gets more complete as it passes the various authorization stages. Well, that battery capacity detail is missing no more, at least for the Galaxy S7 Edge, as the FCC slipped a screenshot in its FCC ID and label positioning document that reveals the number. No such luck for the Galaxy S7, as this information has been successfully concealed for it in the respective document. Just as rumored before, the S7 Edge is equipped with a 3600 mAh juicer, which, coupled with Samsung's stellar component power draw levels, should translate into some respectable battery life. In fact, we already have speculation hinting at the same direction. The Galaxy S7, for instance, which will allegedly have a 3000 mAh juicer, is tipped to last about two days on a charge with mixed usage, and 17 hours of video playback before it gives up the ghost - pretty fine numbers for today's smartphone standards, where most handsets last a day or day and a half on average at best. Moreover, the 3600 mAh pack in the S7 Edge, and the eventual 3000 mAh juicer in the S7, are the largest battery capacities Samsung has ever used in these respective lines, which should further solidify the notion that these phones might also be the longest-lasting, compared to their predecessors, but also when compared to their peers from other brands. In fact, the latest phones in the A-series that we tested confirm that Samsung has made a significant push towards longer battery life, and we hope that this trend will be further exemplified by the Galaxy S7 and S7 Edge. Dang, Samsung starting the year with a huge bang. I'm curious how will the others will do to keep up if the S7 will be as awesome as the rumours said it will be. If it beats the endurance of s6 active, color me impressed. People are fighting over silly wallpapers, but no comments on battery mAh. Yea, a totally mature crowd. S7 Edge can be phone of my dreams. I just hope that here will be USB C 3.1 and waterproofing the same as S5 (IP67?) or even better as last Sony devices (IP68?). I can life without it. Waterproofing is more important for me. I can definitely tell that these devices are not gonna have type c port. Its just not worth it. Plus I can totally live without it. 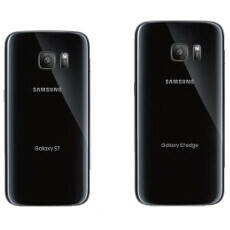 Source:https://www.reddit.com/r/Android/comments/44re87/first_real_image_of_samsung_galaxy_s7_surfaces/czsdwaq "The device in this picture looks plasticy but isn't at all in person, though this is most definitely a picture of the device. I've seen both the edge and normal extensively and these pictures don't don't really do it justice. It's certainly thicker than the S6 in the flesh but doesn't feel it with the curved back. Whoever posted this picture probably just got someone fired, likely not themselves. That being said, everything they posted about the device is correct. IP certification, magnesium metal I think, 12 mp f1.7 camera, type B? (not C) USB"
Thats great! Sounds like a solid upgrade! And I'm glad that they are still using the micro USB instead of type c! Anyone remember S6 Active and how badass the battery life was? Same battery size, probably amore efficient display panel and SoC = AWESOMENESS! Looks like Samsung got everything right for the GS7. Looking forward to the announcement! that's some good marketing samsung....you finally started to listen your costumers and doing the upgrades...you're calling people to buy your phone,...even as a fan of HTC I have to admit you're giving me hard time to pick HTC over you.. It's never a hard decision picking an HTC device over sammy. They have a long way to go before I pick them over HTC...software, UI, physical/capacitative buttons, lack of updates...Typically sammy needs to put bigger batteries to make up for the software. I'd rather just go with a clean, near stock UI and still get good battery life, plus we have fast charging now, so convenient. Wasn't there some sort of new usb cell phone cable that could be inserted either way but kept the same micro usb attributes? What if the s7 uses that, you could still use your cables you have now and still get the type c or lightening cable capabilities of not having to worry about which side is facing up when inserting. Also if the battery is this big now the note 6 should have a 4000mAh juicer!